Beautiful 1.2 acre setting on peaceful Woodas Creek, an East River tributary located on Mathews County's blueway water trail. 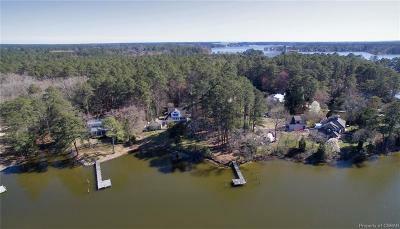 This charming home offers indoor & outdoor living spaces for everyone, a private dock for your boat, crabbing & fishing and an oversized 2 car detached garage. Inside this comfortable floor plan boasts a 1st floor Master Suite with private en suite bath and adjacent three season room, large Living Room with wood floors, crown moulding, masonry hearth & woodstove, Kitchen featuring Corian countertops, 5 burner gas cooking, pantry & huge Dining area all with views of the creek! On the 2nd level, there are two spacious bedrooms, a full bathroom & spectacular vaulted ceiling Sun Room with the most wonderful water views. No flood insurance is required here! A beautiful spot convenient to everything by land or water. Directions: From Rt. 14e, Right Church St, Right Glebe Rd, Right Anchorage Way, See Sign.